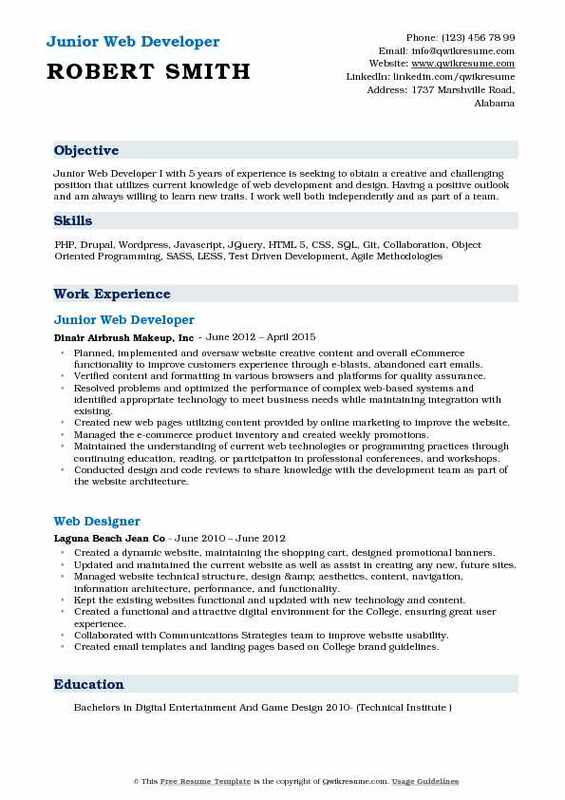 Junior Web developer is responsible for developing, designing, delivering and implementing data-driven web applications for clients. 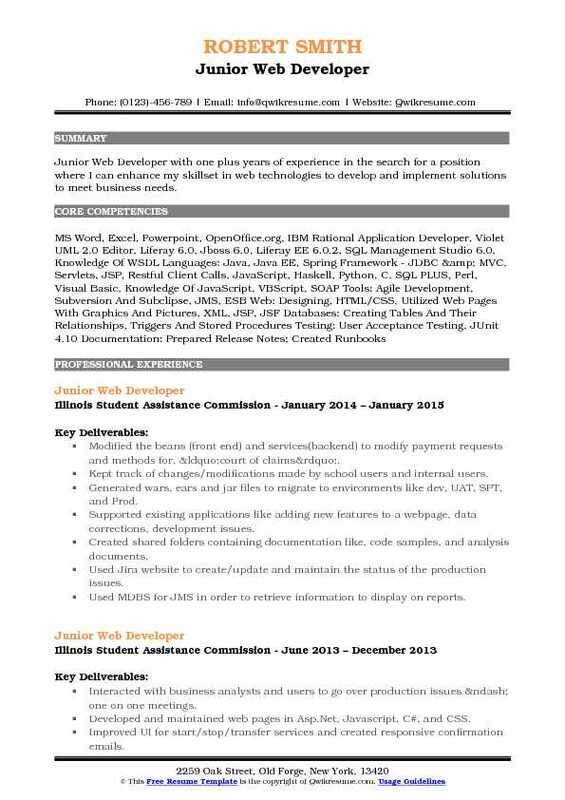 The additional job description normally mentioned in the junior Web Developer Resume include – writing computer codes, using bootstrap for designing responsive web pages, writing well designed testable code for best software development, creating website layout, integrating data from back-end services, gathering and refining specifications, creating and maintaining software documentation and cooperating with web designers for matching visual design intent. 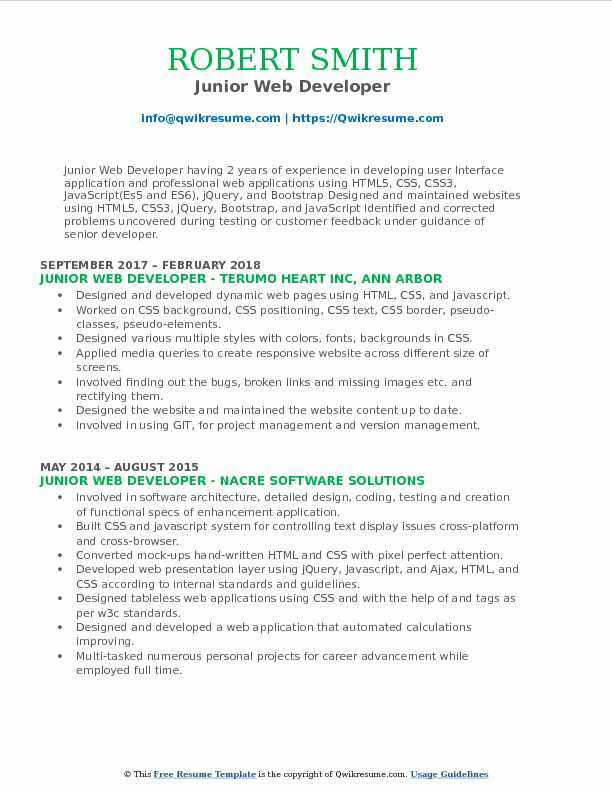 Objective : Junior Web Developer with 3 plus years of experience able to build .Net web applications from the ground up - information gathering, planning, design, development, testing and delivery and maintenance. Extremely passionate towards software architecture and design combined with sensitivity to serve the needs of the business balanced with the delivery of high quality solutions. Designed and implemented internal and client solutions by using Visual Studio 2013, SQL server 2012. Creating models within an MVC application that implements the business logic necessary to satisfy business requirements. The module also describes how to implement a connection to a database using the entity framework and LinQ. Implementing advanced search, paging, and export functionality for each screen. Using jQuery JSON for the dynamic user interface, retrieval, and posting of data. Implementing web services for communicating one application to another application by using SOAP. Implementing WSDL XML document to locate and describe the web services. 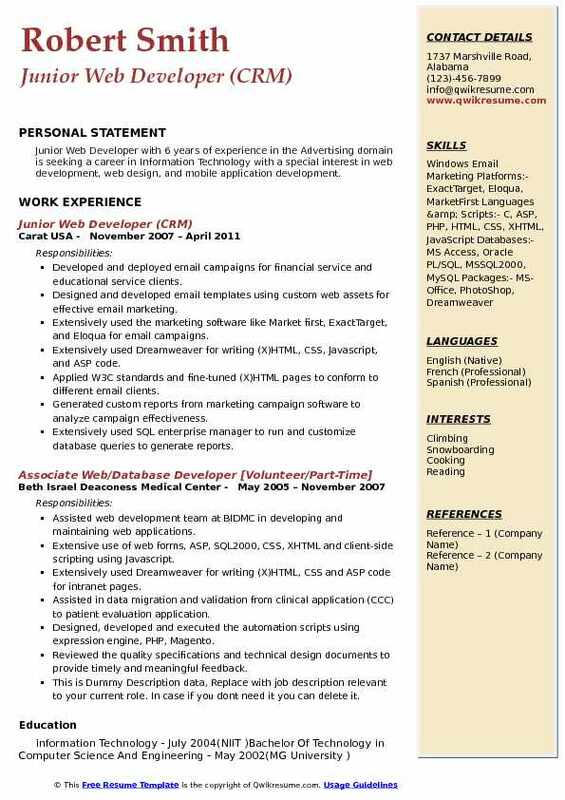 Worked in Asp.Net security mechanisms such as impersonation, authentication and authorization. Working on viva tracker which is the login site for all the T-Mobile stores. Designing web-based ASP.Net internet applications linked to firm-wide SQL databases. Designed, coded and modified applications by implementing knowledge of VB.Net. Conducting software and system testing procedures, release testing, beta support, and bug verification. Executing the programming activities and product design consisting of multiple modules and subsystems. Conducting beta support and complex release testing for the assigned projects and resolved problems found in the software. Creating user controls and custom controls for the common purpose of the whole application. 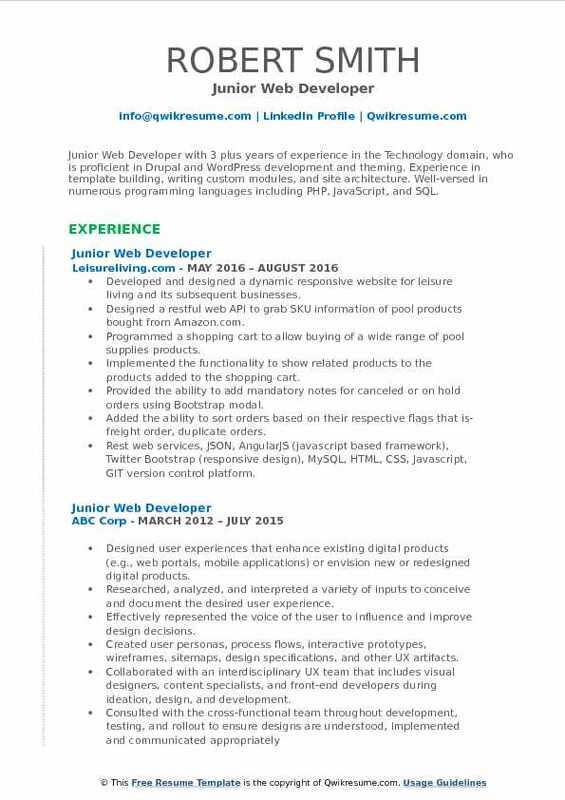 Using Ajax to parse JSON object dynamically overlay contents on web pages. Preparing weekly project report that includes test coverage and status reports. Developed and designed a dynamic responsive website for leisure living and its subsequent businesses. Designed a restful web API to grab SKU information of pool products bought from Amazon.com. Programmed a shopping cart to allow buying of a wide range of pool supplies products. Implemented the functionality to show related products to the products added to the shopping cart. Provided the ability to add mandatory notes for canceled or on hold orders using Bootstrap modal. Added the ability to sort orders based on their respective flags that is-freight order, duplicate orders. 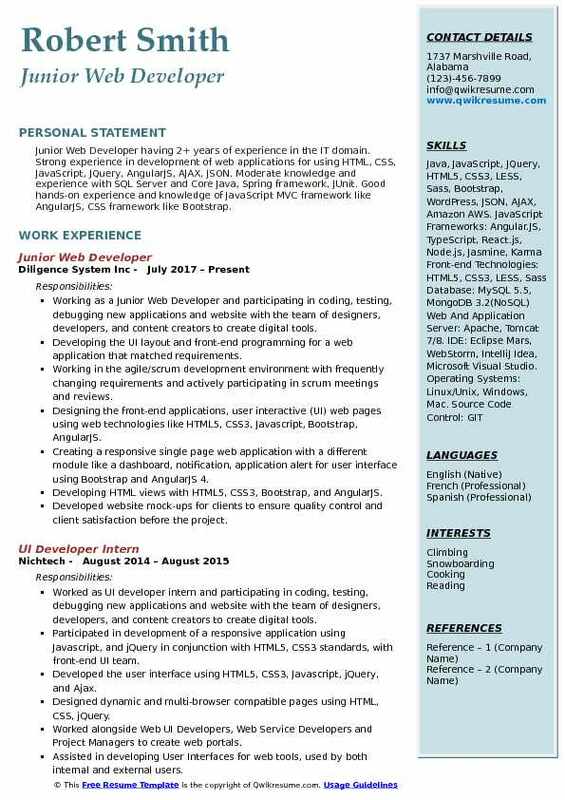 Working as a Junior Web Developer and participating in coding, testing, debugging new applications and website with the team of designers, developers, and content creators to create digital tools. Developing the UI layout and front-end programming for a web application that matched requirements. Working in the agile/scrum development environment with frequently changing requirements and actively participating in scrum meetings and reviews. Creating a responsive single page web application with a different module like a dashboard, notification, application alert for user interface using Bootstrap and AngularJS 4. Developing HTML views with HTML5, CSS3, Bootstrap, and AngularJS. Developed website mock-ups for clients to ensure quality control and client satisfaction before the project. 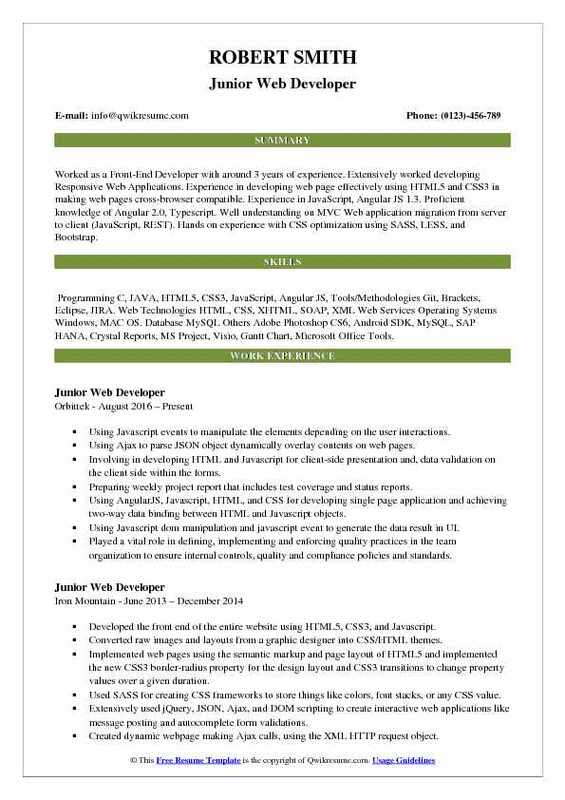 Objective : Junior Web Developer I with 5 years of experience is seeking to obtain a creative and challenging position that utilizes current knowledge of web development and design. Having a positive outlook and am always willing to learn new traits. I work well both independently and as part of a team. Planned, implemented and oversaw website creative content and overall eCommerce functionality to improve customers experience through e-blasts, abandoned cart emails. Verified content and formatting in various browsers and platforms for quality assurance. Resolved problems and optimized the performance of complex web-based systems and identified appropriate technology to meet business needs while maintaining integration with existing. Created new web pages utilizing content provided by online marketing to improve the website. Managed the e-commerce product inventory and created weekly promotions. Maintained the understanding of current web technologies or programming practices through continuing education, reading, or participation in professional conferences, and workshops. Conducted design and code reviews to share knowledge with the development team as part of the website architecture. Worked on CSS background, CSS positioning, CSS text, CSS border, pseudo-classes, pseudo-elements. Applied media queries to create responsive website across different size of screens. Designed the website and maintained the website content up to date. Involved in using GIT, for project management and version management. Improved website security and removed vulnerabilities by enhancing existing code. 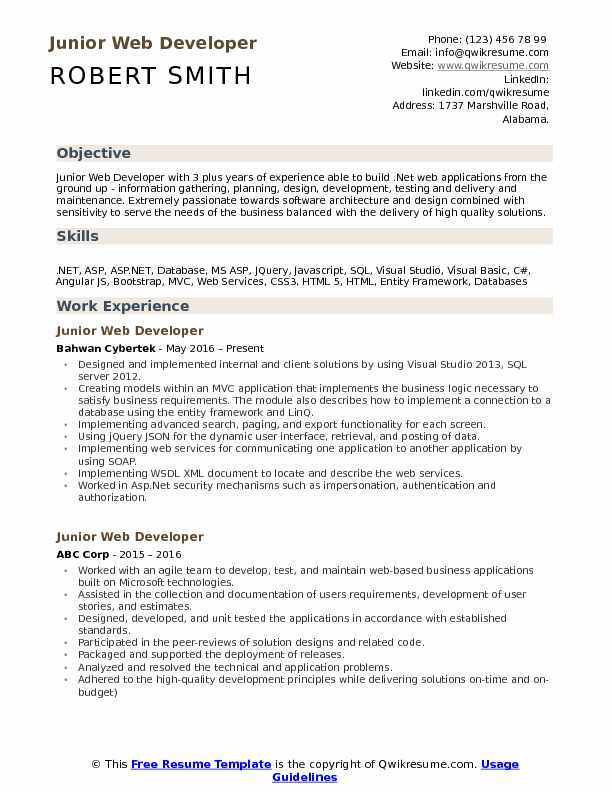 Objective : Junior Web Developer with one plus years of experience in the search for a position where I can enhance my skillset in web technologies to develop and implement solutions to meet business needs. Modified the beans (front end) and services(backend) to modify payment requests and methods for, “court of claims”. Kept track of changes/modifications made by school users and internal users. Generated wars, ears and jar files to migrate to environments like dev, UAT, SPT, and Prod. Supported existing applications like adding new features to a webpage, data corrections, development issues. Created shared folders containing documentation like, code samples, and analysis documents. Used Jira website to create/update and maintain the status of the production issues. Used MDBS for JMS in order to retrieve information to display on reports. Gathered requirements on tasks/assignments from SMEs, and architects – one on one meetings. 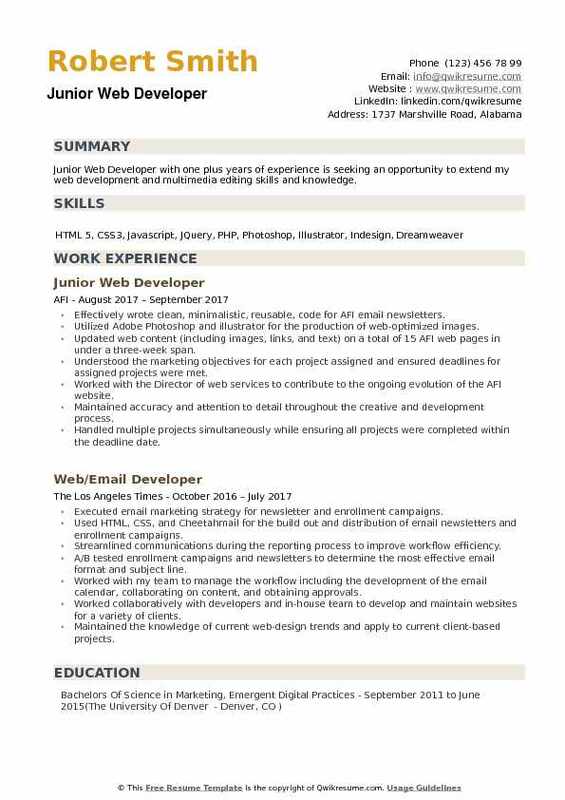 Headline : Junior Web Developer with 6 years of experience in the Advertising domain is seeking a career in Information Technology with a special interest in web development, web design, and mobile application development. Developed and deployed email campaigns for financial service and educational service clients. Designed and developed email templates using custom web assets for effective email marketing. Extensively used the marketing software like Market first, ExactTarget, and Eloqua for email campaigns. Applied W3C standards and fine-tuned (X)HTML pages to conform to different email clients. Generated custom reports from marketing campaign software to analyze campaign effectiveness. Extensively used SQL enterprise manager to run and customize database queries to generate reports. Generated custom image assets using advanced features in Adobe Photoshop for various projects. Worked with senior developers to fix UI bugs for the learning management system. 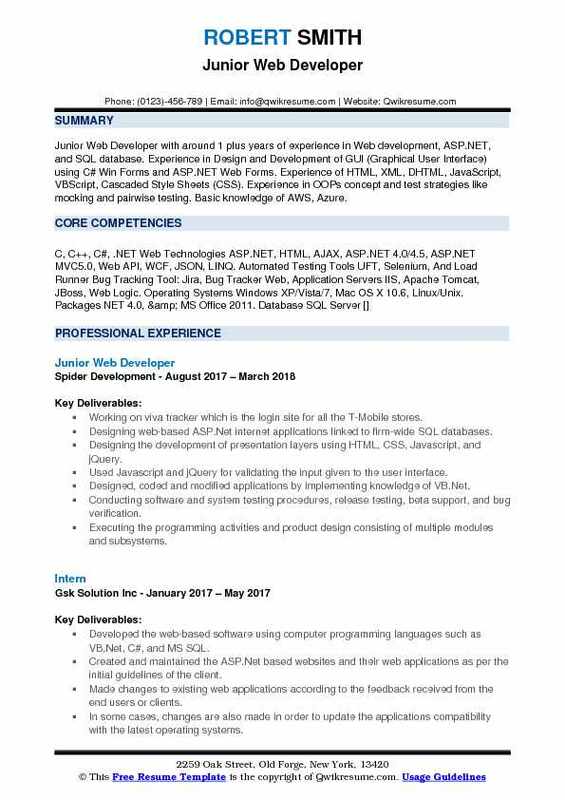 Objective : Junior Web Developer with one plus years of experience is seeking an opportunity to extend my web development and multimedia editing skills and knowledge. Effectively wrote clean, minimalistic, reusable, code for AFI email newsletters. Utilized Adobe Photoshop and illustrator for the production of web-optimized images. Updated web content (including images, links, and text) on a total of 15 AFI web pages in under a three-week span. Understood the marketing objectives for each project assigned and ensured deadlines for assigned projects were met. Worked with the Director of web services to contribute to the ongoing evolution of the AFI website. Maintained accuracy and attention to detail throughout the creative and development process. Handled multiple projects simultaneously while ensuring all projects were completed within the deadline date. Proofread work for spelling and grammar to ensure accuracy and clarity of the final copy. Designed and implemented an image utility application for the company cms.